Looks like only marginal improvement. Tilted Arc presented a long, impenetrable curve that blocked the plaza from the street. The second plaza consisted of softer arcs, which nevertheless presented continuous barriers that further separate the space and disorient the visitor. This third variant is more of the same in its circulation pattern, though it's much more visually appealing. Have they not learned anything? The plaza is already difficult to engage due to being across the street from an existing square. Must they damage it further by recycling similar, problematic, circulation patterns? When the next inevitable renovation comes, I hope they change change their design pattern, though this layout is by far the best of the three we've seen. I walked through here this afternoon. Materials are terrific, although the big blocks & disks of white marble will no doubt get covered in grease stains as folks start using the plaza for lunch. I tried to walk towards the south side of the plaza, near the entry to the US Customs Courthouse (aka the James L. Watson Court of International Trade Building), but was shooed away by the security dude. He said the public isn't allowed along that section of the plaza, between the building and the southernmost planting bed. Lovely. It's nice how the paving matches the magnolias. Is that spot quite sheltered, or does it get windy? Usually the wind comes from the west or sw so mostly it's fairly protected. And in the dog days of summer a good section will be protected from sun by late afternoon. I like how the pavement pattern pretty much matches the tower facade. On its own, the facade is one of the worst in the city, but it plays off the plaza nicely. LeCom nice job noticing that! Yeah this was very well done. Quality materials indeed. It's been a while since I ve walked through there. Definitely gotta check it out this week. I love the facade on that tower. To each his own. Taking the edge off: A federal plaza with a controversial history undergoes another revolution—this one combining elements of a public square and a garden with a high level of craft. Richard Serra’s Tilted Arc, installed in the plaza in 1981, immediately drew fire from the public. In 1989, it was dismantled and removed. Martha Schwartz’s design for the plaza, completed in 1997, preceded MVVA’s current scheme. It included looping, green benches and topiary-like plantings. Sitting in Michael Van Valkenburgh Associates' (MVVA) Jacob K. Javits Federal Building Plaza in downtown Manhattan, at Worth and Lafayette streets, you could forget that a former iteration of the quiet plaza sparked one of the most outsized controversies about public sculpture and artists' control over the fate of their work. Where office workers and sunbathers now inhabit MVVA's design for the wedge-shaped space, with its sumptuous pink granite and marble cobbles and curving gardens hugging marble benches, there was once a rusted steel Richard Serra sculpture and a lot of angst. 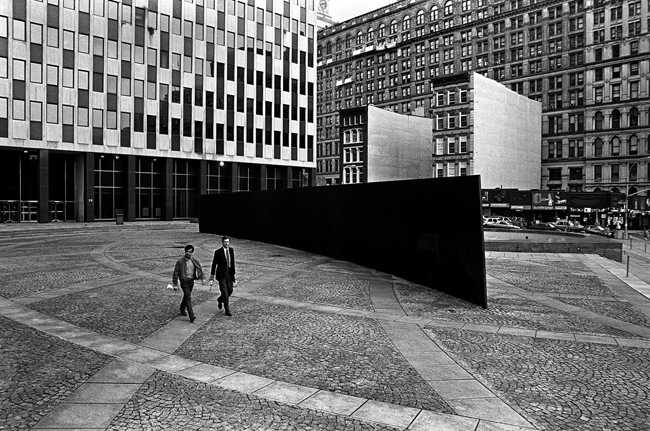 The General Services Administration (GSA) had commissioned Serra to create a site-specific piece for the dreary plaza in front of the Federal Office Building (1969). In 1981 his 12-foot-tall Tilted Arc was installed, bisecting the plaza and running 120 feet. Area workers immediately deemed it ugly and said it destroyed views and made the plaza difficult to traverse. Though prominent artists and others came the defense of Serra's work, the GSA decided the sculpture should be removed. Serra sued the GSA and lost—and in 1989 the sculpture was dismantled. (Serra's studio manager Trina McKeever believes it remains in storage in Brooklyn. The GSA owns the sculpture, but is not allowed to display it anywhere but in its original location.) 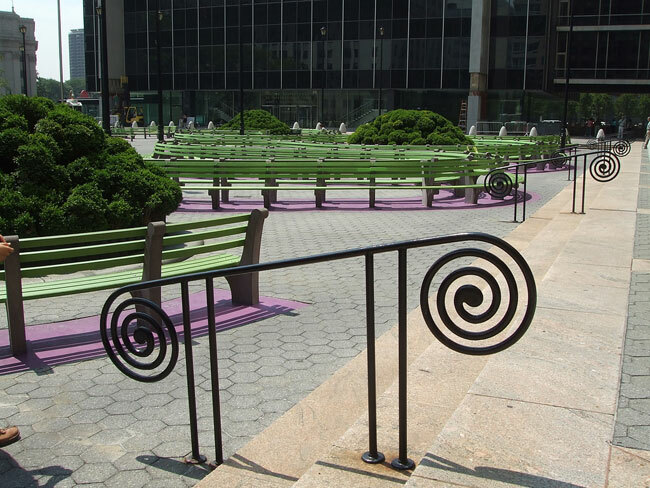 As there had been before Tilted Arc, generic planters and benches returned and stayed until the 1997 installation of landscape architect Martha Schwartz's design for the plaza—looping, bright green benches and topiary-like plants. But by 2008, the roof membrane of the 40-year-old garage below the plaza was failing. To fix it, Schwartz's design had to be removed. While it was the opposite of Serra's sculpture, some argued that the space was still hard to navigate. WASA/Studio A, the architect of record for the project, suggested MVVA redesign the plaza, a GSA project to be funded by President Obama's 2009 stimulus package. Van Valkenburgh, known for his sprawling Brooklyn Bridge Park, eagerly accepted. The landscape architect organized the plaza with four mounded, sinusoidal plant beds. The organic forms embrace buttery marble benches—some discs, others rectangular slabs. A fountain emerges from the pavement on the northeast corner. Though the granite and glass Federal Building—with a jarring design by Alfred Easton Poor, Kahn & Jacobs, and Eggers & Higgins—looms over the plaza, the scale on the ground is intimate. Saucer magnolia trees do much of that work. “We thought that the grayness of the site in the winter should end in the spring with some fantastic explosion of blooms,” says Van Valkenburgh. The cobbles, patterned to be a “jazzy riff” on the woven checkerboard facade of the Federal Building, also help soften the space. “It's sort of like the facade reflected in water,” he says. The plaza is inviting, in part, because of its obvious craft. From the benches, for which the marble was handpicked from a Vermont quarry, to the bronze garbage cans, which appear to balance on their rounded bottoms from sheer centrifugal force, the luxury of the hard surfaces complements the garden elements. Van Valkenburgh and MVVA principal Gullivar Shepard describe how the masons tried to keep together the veining of the marble cobbles as they took them off the palettes. “It's mind-blowing how beautiful the patterns are,” says Van Valkenburgh. The architects removed stairs within the plaza that negotiated grade changes due to the sub-slab and instead created a softly undulating surface that slopes to meet the sidewalk. “All of the previous schemes worked within the model of a plinth, which separates the plaza from the street. Ours is designed to blur that boundary and be more inviting,” says Shepard. While the plaza is a part of downtown's workday frenzy, it balances privacy and engagement, allowing visitors to perch above the fray but still observe it. The architects couldn't change the size of the site, but they could—and did—create a sliver of more enjoyable living space for city dwellers. With new Michael Van Valkenburgh landscape, Manhattan's Federal Plaza goes from high art to citizen's forum. The Foley Square side of the 1968 Jacob K. Javits Federal Office Building on Lower Broadway is one of the most beautifully detailed and thoroughly usable new public spaces in New York. 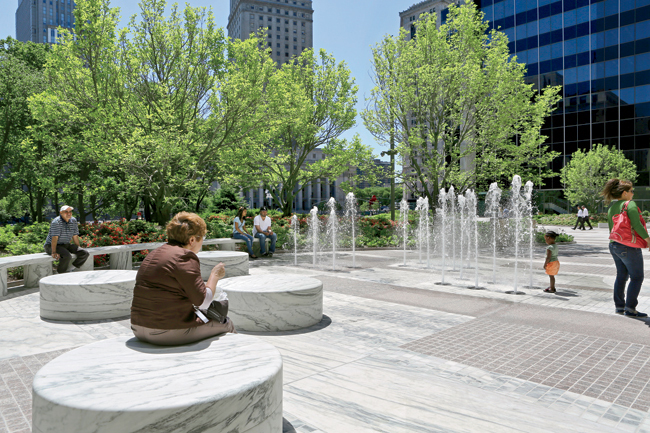 Designed by Michael Van Valkenburgh, the plaza features Connecticut pink marble that alternates with Vermont ‘Danby’ stone, establishing what the landscape architect called “an abstract naturalism.” The treatment gives depth and character to a space that strives mightily to overcome the banality of the Federal Building’s towering curtain wall. It achieves this. The plaza is so pleasant now it is hard to remember when this space was considered one of the worst public spaces in New York. Not only was it a thoroughly unusable space with barely any seating or plantings, it was also dominated by Richard Serra’s 1981 CORTEN steel sculpture, Tilted Arc. In 1984, it became one of the most contested public sites in the country when the regional administrator of the U.S. General Services Administration (GSA), William Diamond—whose office was in the Federal Building—decided to make it his mission to have the sculpture removed. Successive redesigns of Federal Plaza by Serra (above) and Schwartz (below) reflect changing ideas about public space. While the art world rallied to Serra’s side in the controversy, his argument and position on public space was unsustainable and the sculpture was taken down, cut into three pieces, and moved to a storage facility. Today, it would be unimaginable for a public park designer to make claims like Serra did for the arc and be given a commission anywhere in the city. The GSA contacted landscape architect Martha Schwartz before the removal Serra’s arc about modifying the plaza, but these plans never materialized. When the decision was made to remove the arc, the agency commissioned her to do a total redesign of the space. Schwartz thought of her redesign as a place to “sit and have lunch.” She created a series curvilinear green benches and mounds of grass (later changed to small bushes) surrounding steam emitting pipes. She called the seating “luscious, with great curves,” which she thought of as more approachable version of Serra’s arc. The plaza surface was painted purple in serpentine patterns. The Schwartz design proved to be no more than an interlude while New York City public space design moved toward the notion of inhabitable places. When Van Valkenburgh was brought in to create the current iteration of the space, he looked to the Broadway side of the Federal Building, where immigrants line up seeking Visas and citizenship papers. 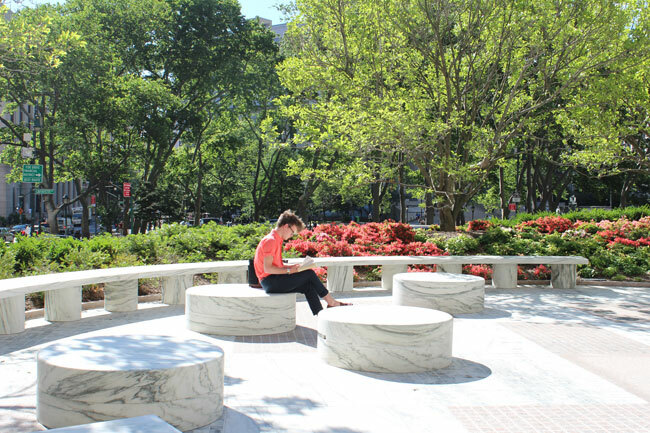 When many of these immigrants walk out the Foley Square side of the building as new citizens, Van Valkenburgh wants them to “feel good about this fact.” His design for the plaza sends the message that, here in the U.S., the public realm is to be inhabited and enjoyed. The buildings that were destroyed for the tower. Thank you for this. I was watching the Grammys last night and they had a commerical for some Amazon original series that takes place in NYC early 20th century. 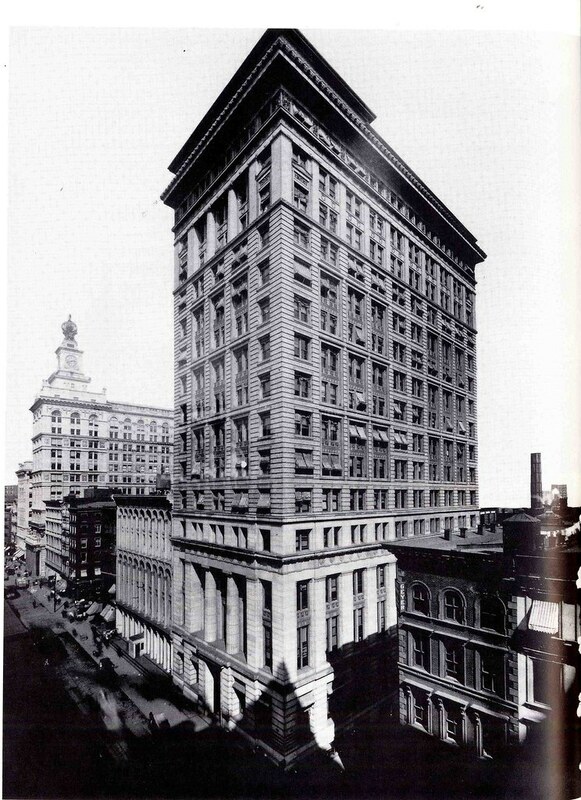 They had a scene which was obviously photoshopped with the original & still existing federal courthouse on the left (which they had written "Pennsylvania Station" on), but on the right was a series of older traditional buildings that looked straight out of broadway but would have been demolished since. Last edited by londonlawyer; February 14th, 2017 at 06:48 AM.